The objective of Ice Cream Madness is to bounce the scoops of ice cream (colored whiffle balls) off of the ice cream scoop (on the table) and land them into the ice cream cones. The Ice Cream Madness carnival game operator determines how many scoops wins a prize. 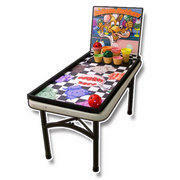 The Ice Cream Madness game is great for the 5 - 12 age group.